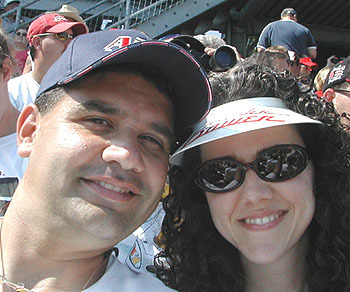 October, 1 thru 3 2004. 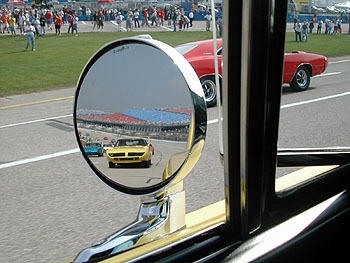 I was thumbing through Muscle Car Review Magazine 9 years ago and came across a write up on the 25th Anniversary meet at Talladega Speedway hosted by the DSAC - (Daytona SuperBird Automobile Club). I read the article many times and could not believe the number of cars that had attended this meet. I knew at that moment that I had to go. The only problem was, No Wing car, yet! Well, I had time to fix that problem as the meet is held every five years on the 5th anniversary dates of Talladega Speedway ('94 '99 '04 '09) . I showed Sharleen the article and was very excited about it. 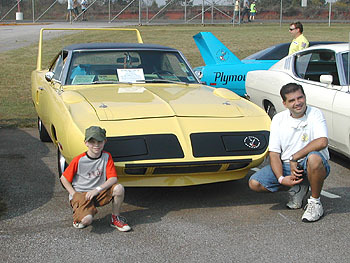 I told Sharleen that we would be there with our SuperBird or Daytona in 1999. Sharleen at that time reminded me that we did not own a wing car and that I should first take care of the obvious, getting a wing car! So I set out on a journey that took five years and seven months. I looked high and low for just the right car. I wanted a 4 Spd. 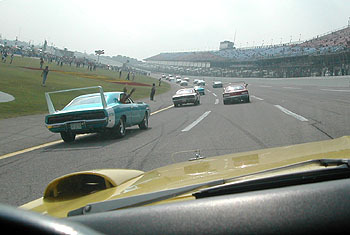 SuperBird or Daytona. Color or motor did not mattor. I would of settle for any well restored wing car. In the summer of 1999 I purchased my 440 6BBL 4 Spd. Superbird. that summer was awesome, I drove the car every weekend to every show I could. 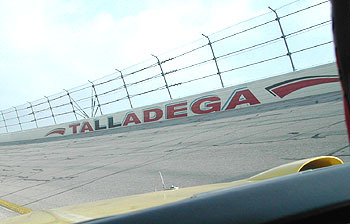 I had missed the 1999 meet by one month as that year the Talladega race was run in the Summer, not Fall. Even though I had missed the meet I knew I would be there in 2004. I joined the DSAC at the beginning of this year to make sure I would be in the loop with all the happenings of the meet. I Sent in my entry fees and booked my hotel. We were ready to go. On Wednesday September, 29 we left on the first leg of our journey. Thursday September, 30 and 1269 miles later we arrived in Alexander City, Alabama. The weather was perfect for the entire weekend in the mid 70's to low 80's. When I pulled into the hotel parking lot I was grinning ear to ear, excited about the three Daytonas and two Superbirds parked in the hotel parking lot. At the Walmart down the road they had Nascar City set up with the Coca Cola Team, Elliott Sadler and the Hendricks team show cars and simulators. WOW! This was awesome to see and be a part of. I changed a tire in 13.69 seconds, Sharleen and I raced the Talladega simulator and we took our pictures with Tony the Tiger. COOL! We were having a lot of fun. Friday was set aside for a gathering and picnic at Tim and Pam Wellborn's home. 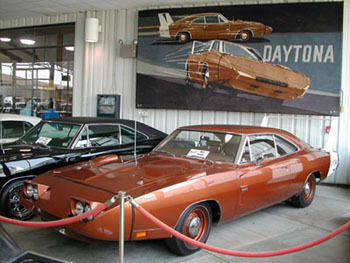 Tim is an avid Mopar collector with over 30 vintage mopars in his collection- four Daytonas, two Superbirds, eleven 71 Hemi Chargers and Super Bees and many more Mopar Muscle Cars. This was one of the highlights of the weekend with over 125 winged and aero warriors (Charger 500's, Talladegas, Cyclones) attending friday's event. Tim and Pam's hospitality was second to none, they hosted one great day. Saturday at 6AM, we met for a parade to the Talladega Motor Speedway. The speedway was over 60 miles away from Alexander City. Meet host Doug Schellinger mapped out a scenic drive for us. We had over 150 cars in our parade to the track. We arrived at the track around 9AM and lined up for a panoramic shot of all the cars in attendance. 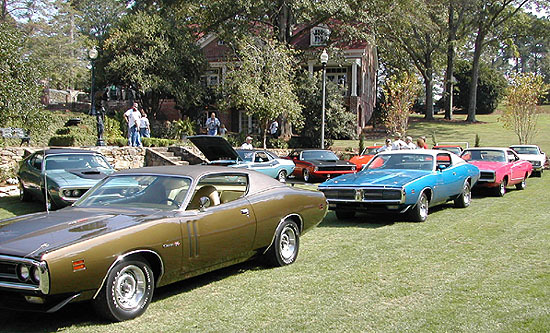 One car worth mentioning was my old 1967 Hemi GTX. You see the previous owners (Jim & JP) of my Bird are the present owners of my Hemi GTX. Jim and his son JP have become great friends of mine. Jim has taken very good care of the GTX and has given the Hemi GTX a new paint job. After the panoramic picture, we toured the Hall of Fame Museum. Here, we saw many vintage stock cars and even some of the great wrecked stock cars of years past. Next, it was time to go see the ARCA race. We were off to the Allison Grand Stands on the back stretch. Here we saw one great race for the finale of the ARCA season. Sunday, the big day! We loaded the SuperBird into the Trailer the previous night and were ready to go. We checked out of the Hotel and then we set off on our own to the track. 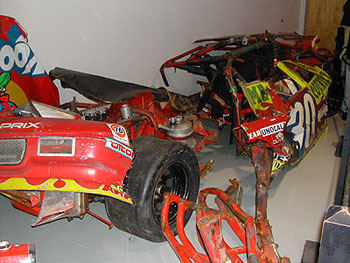 I had been thinking of the seats we had for the ARCA race and decided they would not be good enough for the Cup Race. Just before we arrived at the track we found a ticket scalper and made a trade for front stretch pit entrance tickets, right in the middle of all the action. 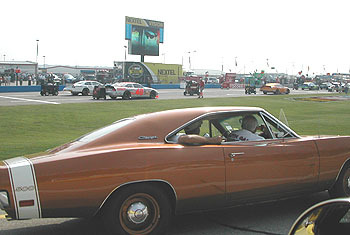 After we upgraded our tickets, we proceded to the Nascar Test Track Entrance where we were escorted to a staging area where we all waited for our Parade lap of the Speedway. YES, we got to drive on the track. YES, the Racing Surface! By 9:30AM we had 5 rows over 40 cars deep of wing cars and aero warriors. At 10AM Tim Wellborn gave the 5 minute warning. We received our official Parade lap passes and were off. WOW! 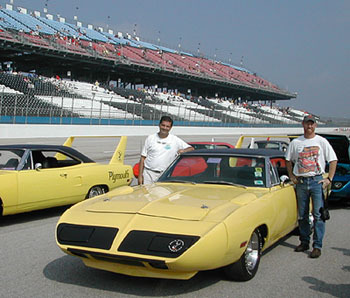 I have gone to a couple of Nascar track tours but actually driving my SuperBird on the Talladega Motor Speedway was awesome. We were asked to stay on the lower area of the track, so I kept a steady speed just below the Yellow out of bounds line.Due to the pitch of the track, Sharleen and my friend Rich had to brace themselves from falling out of their seats. Then we were staged on the front straight just before the pit entrance. We were given time to take photos of the cars and then we were introduced to take our parade lap. We double filed out onto the racing surface and paraded pasted the main grandstand, past the starting line stage, into turns 1 and 2. Onto the back stretch we accelerated thru the gears and exited the track back to our staging area. I decided it would be a good time to put the Superbird in the trailer and get ready for the race. Sharleen kept on asking me, "was it everything you thought it would be?" I said, "YES", and I can't wait till 2009 when I can do it again.